Use flexible SDKs to create sophisticated solutions that integrate with proprietary applications. Use Laserfiche Connector, a wizard-driven tool, to integrate line-of-business applications with Laserfiche without programming. Access and search documents, launch scanning, populate document metadata and perform other routine tasks directly within third-party systems. Integrate easily through user-defined hotkeys and embedded icons. Create searching and scanning profiles that end users can individually customize. 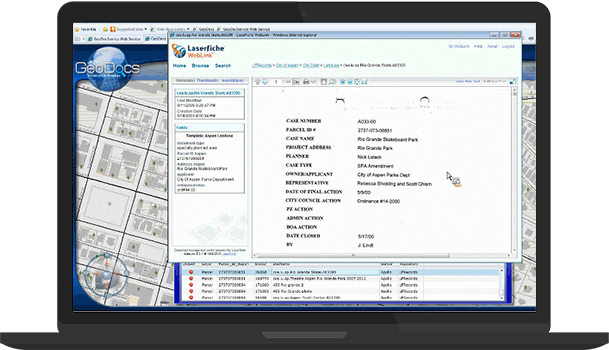 Retrieve information from any integrated application or send it into Laserfiche with a single click. Save Word documents, e-mails and PowerPoint slides into Laserfiche directly from Microsoft Office applications. E-mail documents directly from the repository. 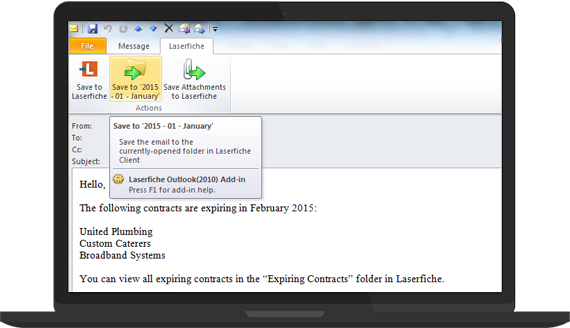 Import e-mails and attachments into Laserfiche with a single click. Open Office documents in Laserfiche directly in their native applications, and add or change Laserfiche metadata without leaving that program. Create custom applications and integrations with the Laserfiche Software Developer’s Kit (SDK), a highly flexible and open programming interface. Build a tightly integrated information infrastructure with pre-built merge modules for rapid integration, COM, .NET, and Java libraries in 32-bit and 64-bit, and a batch importing engine. Automate Laserfiche-related tasks such as indexing and retrieving documents, populating template fields and automatically generating emails. Leverage an extensive library of C# and VB.NET sample code to help tailor functionality to your specific business needs. Browse hundreds of pre-built integrations to connect Laserfiche with core applications. Purchase pre-built integrations for popular products including DocuSign and Salesforce.